During nearly four decades of marriage, Akosua Budu Amoako and her husband tried to have a child, without success. But last month, at age 59, Budu gave birth to her first child after fertility treatments. The full-term 7-pound, 4-ounce boy was born June 15 at Bellevue Woman’s Center in Niskayuna, near Albany. He’s named after his father, Isaiah Somuah Anim. Budu said she and her 59-year-old husband, who live in Schenectady, had tried for years to get pregnant naturally after they married 38 years ago, but they eventually stopped trying. 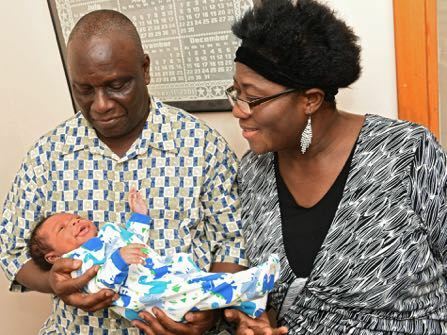 Then last year, after learning that a 60-year-old woman in the couple’s homeland of Ghana gave birth to triplets after fertility treatments, the couple, both medical professionals at a local hospital, decided to try once again to have a child. Irani said he was apprehensive at first, noting the risks of complications that can arise from giving birth at such an advanced age. Budu underwent in vitro fertilization at an Albany-area clinic using her husband’s sperm and a donor egg. The entire process, from initial screening to successful fertilization, cost $20,000 and took about a year, the elder Amin told the newspaper. “We haven’t gotten much sleep, but I feel fine and I think he already knows our voices,” Budu told the Times Union. The couple, who came to the United States in 2005, are naturalized U.S. citizens.